Starting Sept. 22, the phrase “Pack it in, pack it out” will have a new meaning to visitors at Canyonlands National Park in southern Utah. When nature calls, backcountry campers will no longer be able to simply dig a hole to leave their organic deposit. The park’s remote southeastern Needles District is joining a growing number of Western public lands that require visitors to haul out their own poop. Chesler Park is one of the areas in Canyonlands Nation Park's Needles District where overnight campers will be asked to pack it all out. Human waste, as the literature so gently calls it, has long been a problem at some of the country’s more popular public lands. On the trail, hours or even days from a toilet, what’s a functioning human to do? Leave No Trace, the popular guidelines to minimize backcountry travelers’ impact, suggests digging a hole far from any water source and well off the trail. After defecating in this “cathole,” cover it up so animals or your fellow hikers won’t find it. Another method that has largely fallen out of favor, but once preferred for arid climates, is the smear technique. Spread thin like paint, the feces dry up in the sun and blow away. These techniques can work well over a landscape but in high-traffic areas, things can start to get gross. Multi-day backcountry hikers in Canyonlands' Needles District are required to camp in designated areas and many don’t wander far to relieve themselves. Over the years, given the approximately 5,000 backcountry permits issued annually, the improvised toilets around the backcountry campsites have built up. “You can’t dig a cathole without hitting (another) cathole,” says Paul Henderson, assistant superintendent at Canyonlands. In a wet landscape where organic matter decays quickly, such as the forests of the Pacific Northwest, poop from a few thousand people deposited throughout the year might not be such a big deal. But in the desert, with very little rain and limited organic matter in the soil, those brown piles take a long time to decompose. Like desert environments, alpine ecosystems also have a difficult time digesting piles of human waste. Climbers ascending Mt. Whitney in California and Mt. Rainier in Washington must pack out their poop. Other popular areas, like the Conundrum Hot Springs in the Maroon Bells Wilderness in Colorado, don’t have a poop mandate, but strongly urge hikers to use waste bags that are available at the trailhead. 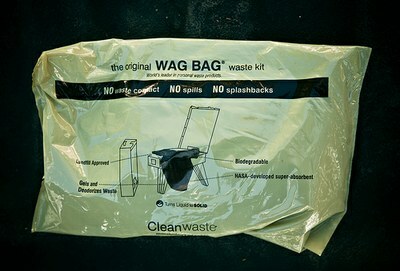 The WAG Bag has been a popular option for back country waste hauling. The technology for dealing with backcountry excrement ranges from cheap, do-it-yourself receptacles to multi-part systems available for purchase. A popular method for rock climbers on long, multi-day routes is a PVC pipe glued shut at the bottom and a screw-top closure. Some hikers have taken to strapping this device to their backpacks. They are cheap and easy to make at home, and the sturdy tube means no accidental punctures. WAG Bags, a two-bag system, which come pre-loaded with powders to congeal and deodorize, are a glorified version of the black or green bags that many parks make available for clearing doggy doo. You can use one bag as a glove to scoop up what you’ve left behind and seal it all up in the second. And finally, if squatting and scooping isn’t for you, you can bring the comforts of home on your travels with a fold-up potty. The basic technology is like the WAG Bags but also provides a foldable chair to sit on. While day hikers in the Needles District aren’t subject to the new "pack it out" rule, the visitor’s center will have waste bags available for any conservation-minded guests who want to voluntarily participate. The park won’t have a ranger standing at every trailhead to distribute the bags, but still, Henderson says, “we would be thrilled if day hikers would use them as well." Katie Mast is an editorial intern at High Country News. Image of Chesler Park courtesy the National Park Service via Flickr. WAG Bag image courtesy Patrick Maloney via Flickr.